In this post we will use 3850 (acting as MA) to communicate with centralized 5760 (acting as MC). 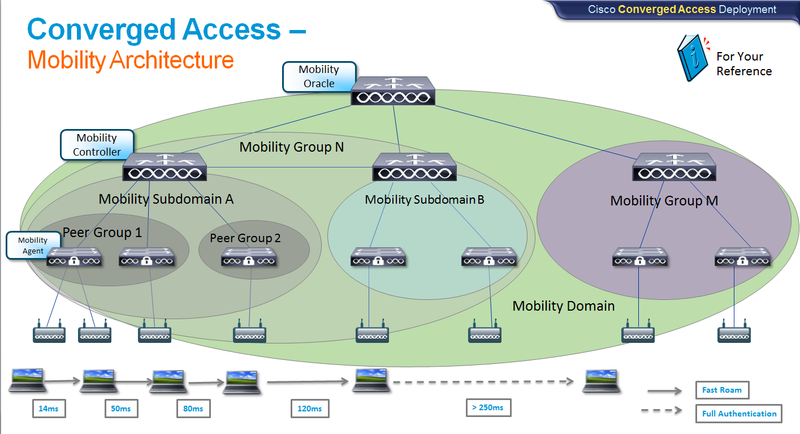 Below diagram summarize overall mobility concept in Converged Access (CA) deployment. • A Mobility Domain (MD) is the entire domain across which client roaming is supported. It is a collection of mobility groups. For example, a campus network can be considered as a mobility domain. • A Mobility Group (MG) is a collection of mobility subdomains across which fast roaming is supported. The mobility group can be one or more buildings within a campus across which frequent roaming is supported. • A Mobility Subdomain (MSD) is an autonomous portion of the mobility domain network. Each mobility subdomain contains one mobility controller (MC) and a collection of SPGs. A subdomain is equivalent to an 802.11r key domain. • A Switch Peer Group (SPG) is a collection of mobility agents. • The Mobility Oracle (MO) acts as the point of contact for mobility events that occur across mobility subdomains. The mobility oracle also maintains a local database of each client in the entire mobility domain, their home and current subdomain. 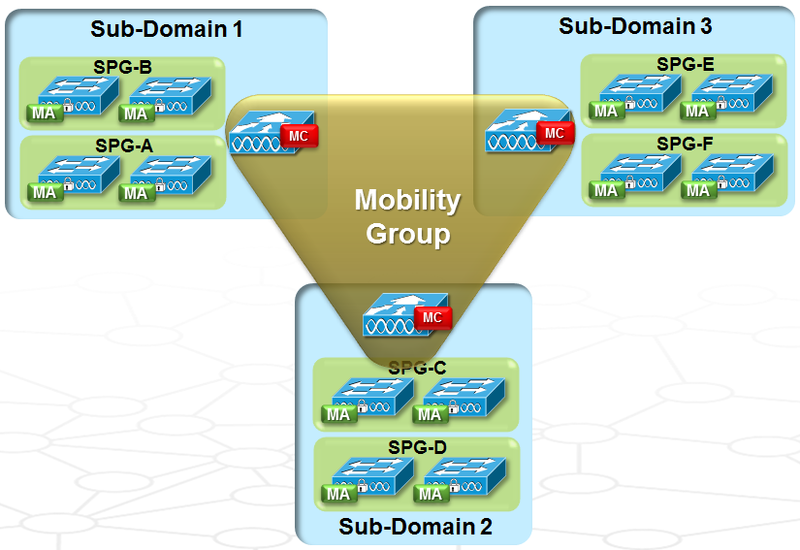 There is only one MO for an entire mobility domain. The Cisco WLC 5700 Series Controllers or CUWN controller can act as MO. • The Mobility Controller (MC) provides mobility management services for inter-SPG roaming events. The MC sends the configuration like SPG name and SPG peer member list to all of the mobility agents under its subdomain. The WLC 5700 , 3850 Switch, or CUWN controller can act as MC. The MC has MC functionality and MA functionality that is running internally into it. In converged access, fast roaming is available within a Mobility Group (not like between mobility groups in Unified Wireless). If it is inter-mobility group roaming client has to full-authenticate. Within a mobility group you can have multiple sub-domain.Each sub-domain should have its own MC & that will keep the client database within that sub-domain. Within a sub-domain, you can create SPGs (Switch Peer Groups) to optimize roaming by constrain roaming traffic to small area (eg for a building). Below diagram represent this concept. Next question is what is max SPG in a sub-domain ? max mobility sub-domain (MSD) per MG ? Max MC in a mobility domain (MD) ?. Below table summarize & keep these in mind when designing CA solutions. So here is my test topology. Effectively it is within a single mobility sub-domain where 5760 acting as MC & two SPGs. Then you need to tell 3850 about its Mobility Controller (MC) as below. If firewall or NAT devices sitting between MA & MC then you need to use “public-ip” option as well. In my configuration it is not required. 3850-2(config)#wireless mobility controller ip ? 3850-2(config)#wireless mobility controller ip 10.160.49.1 ? You can verify 3850 mobility configuration using “show wireless mobility summary” CLI command. As expected mobility is down since we haven’t configure the MC yet. Also SPG name is blank. MA will learn its SPG name via MC. Let’s move on to 5760(MC) & start configuring it. We will give “BUN-1” for the group-name & then will create a SPG called “SPG1” and add 3850-2 as member of that SPG. 5760-1(config)#wireless mobility group name ? 5760-1(config)#wireless mobility controller peer-group ? 5760-1(config)#wireless mobility controller peer-group SPG1 ? 5760-1(config)#wireless mobility controller peer-group SPG1 member ? 5760-1(config)#wireless mobility controller peer-group SPG1 member ip ? 5760-1(config)#wireless mobility controller peer-group SPG1 member ip 10.161.33.22 ? Now if you go to 3850-2 & check the mobility summary you should see the paths are UP & it is learning its SPG name as well. Now let’s try to register the AP. Prior to that make sure your 5760/3850 is configured for the correct regulatory domain/country code. Keep in mind you need to disable the radio bands prior to change the country code. Changing country code could reset channel and RRM grouping configuration. If running in RRM One-Time mode, reassign channels after this command. Check customized APs for valid channel values after this command. Make sure you have same configured on your MA as well. Here is the AP console output of successful registration. *Mar  1 00:00:56.927: Logging LWAPP message to 255.255.255.255. *Mar  1 00:01:12.967: %CAPWAP-3-ERRORLOG: Did not get log server settings from DHCP. If you look at MA, you should see this L3602-1 is registered to it. If you look at the license, it does not have any license & it is always come from a MC. Here is a CSC forum post listing all useful CA reference materials. Please read all of those if you are interested to learn. I like you blog and its good info 🙂 keep this up. I have a small question i read somewhere that if 3850 is acting as MA then AP and Wireless management interface should be on same sub net. That’s correct, in MA you have to use same vlan as wireless management & AP management. That’s why my APs are in vlan 1610 which is the wireless management interface as well. MC can be anywhere in your network with L3 connectivity to MA. So in my case I have configured it using “wireless mobility controller ip x.x.x.x” command. Thanks for sharing all these good stuff, i have a question, can 3850 be both a MA to a centralised controller say 5508 in hq and be a MC to small office hosting 2-3 AP? what is the best practise? 3850 can be act as MC/MA together. In that scenario it won’t be a MA for another central controller. It is similar to have a dedicated controller at branch & if you need you can configure mobility between that & your HQ controller. hi, i’m new in this wireless arquitecture so i’m sorry if my questions sounds stupid. I have 3, 3650 switches working as MA in different locations and one 5760 working as MC in HQ office. if the 3650 ends the CAPWAP tunnel and all the WLAN config must be done in the switch, whats the 5760 funtion in this scenario? can i manage and configure the AP’s (3702) from 5760 even is the AP’s are registered in the 3650’s? but what about WLAN’s? if i create a new wlan in the 5760 the AP’s registered in the MA switch doesn’t know about this WLAN. other option is try to end the CAPWAP tunnel in 5760 and keep the traffic locally in the remote office (flexconnect) but i don’t see this option in this equipments, furthermore we want to use AVC, and i don’t know if we want to use it, the switch must ends the CAPWAP tunnel. if the 3650 ends the CAPWAP tunnel and all the WLAN config must be done in the switch, whats the 5760 funtion in this scenario? can i manage and configure the AP’s (3702) from 5760 even is the AP’s are registered in the 3650′s? Wow!!!! You are very fast answering my questions!! Very good explanation. Thank you very much, now i understand how it works. Your blog is helping me a lot, regards from spain! Your article insights my wireless network design to go the next generations. My environment has multiple regions which have different regulatory demands. In higher version of IOS can support multiple country codes setup, referring to Cisco web site. Do you know whether 5670 can do that as well ? Additionally, I could not find the reason why Cisco says AP has to be directly connected to Cat3850, do you have any idea? Regarding AP direct connectivity, that is based on this new architecture. QoS & other policies applied to wireless ports (ie AP connected) assuming AP is directly connected & some of those policies are not configurable. Therefore Cisco will not support indirectly connected AP as those policy config is not valid in that scenario. Pls help me to troubleshoot. Post the output of “show wireless country configured”. Looks like you have regulatory domain config issue as per the below. I have setup the WLC-5760 as MC and the 3850 as MA. How do I check that the capwap has actually been terminated on the 3850 vs. the WLC-5760? if you type “show ap summary” only 3850 MA should give an output specifying AP registered to 3850. Here is the output on the WLC 5760. As you can see the AP is registering with WLC controller and not the 3850. Pls post “show wireless mobility summary” output from both devices. Here is the output on the WLC controller. On the 3850 where the AP is connected. I have an architecture with 3850(MA) and 5508(MC), i can show that the txpower is configured on automatic mode in my 3850. But i need to known the exactly txpower of my AP. Where i can find this information ? on the AP, or on the 3850 ? I have a question of work SW 3850 (MA) with CAPWAP AP 3602 and WLC 5760 (MC). What happens with AP 3602 if the connection with WLC 5760 is lost? Continue wireless connection or link with the access point will be lost? AP will work as normal, no impact for the Data traffic. Hi. I have a question of work SW 3850 (MA) with CAPWAP AP 3602 and WLC 5760 (MC). What happens with AP 3602 if the connection with WLC 5760 is lost? Continue wireless connection or link with the access point will be lost? Yes, even 5760 is down, your wireless will work. Only impact is you cannot register new APs, no RRM related functions while MC is down. Hello. Thanks for the great article although I have a question. Sounds like you have to duplicate the wlans from the MC that you want to use on each switch that will act as MA. This means that you also have to trunk out the client vlans used for these wlans to each MA as well? Or do you assign the building data vlan to be used in the wlan? In my setup all user SVI defined on the distribution switch where MAs get connected. MC is on separate L3 domain & no MA connected switch vlan extended over there. Thanks for the reply. That makes perfect sense! It’s better to use the building svi for the client traffic anyway. From my understanding when a client roams from one building to another, if that building is in the same group then the client retains that previous building’s IP address which is tunneled to the new building unless the client disconnects which breaks the tunnel? In My setup for MC and MA . sh ap join stats summary shows different IP for AP and sh cdp nei show different IP for AP .why is this happening . In my case my access point is connected to MA and is associated , registered too, the licenses is OK, peer group up everything OK, but my AP is not sharing any ssids. PS. : The AP is associated to the correct AP Group. That’s strange, if APs in right AP group and SSID already configured it should work. >>> I tried to create another AP-Group, insert the AP there but it does not work. >>> I tried another radio, does not work. >>> I tried to reload the switch, does not work. We has some a small environment consisting of 3 offices. Main office running Layer 3, and 2 remotes with the Vlan extended to them via fibre. We do not feel we need to deploy a 5760, instead we want to use a stack of 3 x 3850 (L3) in MC mode and the 2 remotes office having a 3850 each in MA mode. I will be distributing 4 AP in one office and 10 in the other, and 30 in the main office. Is there an issue with this design, do we need to look at running each office switch in MC? Hi Mike, if you have 1G fibre between these sites, I do not think you require MC in each site. I have set up my 3 build environment. Made 1 3850 the MC, and the other 2 builds 3050 Stacks MA. I am running 3.6.4 recommended by Cisco, as Denali 16.1.2 had TACACS authentication issues and if still a bit flaky. I created the SPG, and all units are talking, but my issues is I cannot see any clients on either office that is running the MA’s, but the MC has over a dozen connected. HI, May I ask question? Our WiFi quiet complicate, mixed between centralized controller and converge controller. Our design, we have only one SSID shared for whole compound (we have three building). Suppose, your 3850-4 broadcast SSID name as “WiFi”, client vlan is 5, network 192.168.1.0/24. and 3850-3 broadcast SSID same name as “WiFi” but client is in different network, client vlan 10, network 10.10.1.0/24. Our problem is mobility, it is not stable. Do you think mobility function work between 5760 and 3850? In my case 5760 is purely MC role, no AP managed by that. 3 nearby buildings 3850MA stacks configured for same SPG. So roaming between those APs are seamless. MC is only actively involve, if you roam between two SPGs. Thanks for documenting this subject so well. However, there is an aspect of the use of the switch as an MA that escapes ne…i understand mobility when using a WLC, the client’s traffic emerges into the wired network from the controller regardless of where it entered or what IP address the client leased on association with the AP. As a result, it will always be emerging from a known interface on a known, constant subnet, and traffic can be routed back to it simply. What I’m struggling to understand is how mobility works with the 3850 or similar switch, where the CAPWAP tunnel terminates on the switch. That being the case, traffic from a client may emerge in different places/subnets on the wired network. The traffic will get to the wired network OK, but how does it return? The client, with its constant address will apparently pop up anywhere in the network, which may be managable in a L2 network, where VLANs can be trunked to all switches, but what happens in a routed network? Even client moved to different AP(across routed network) still client keep the original IP & traffic is tunneled back. All the nodes can ping each other. But MC and MA links stay down.. Hence the APs never register with MA or MC. How we should debug this issue, please advice..
One more think to mention here is that.. BTW the MC(5760) and the MA(3650).. we’re using a 3850 just as a switch.. But somehow I’m not able to disable Mobility from the 3850… it always shows as a MA… though there is No Wireless Mgmt on it..
Would you be knowing how we can convert a 3850 to just a switch and disable mobility completely from it..? If three is no wireless management interface then that’s it. In that case switch does not act as MA. But somehow the connection btw the MC and MA through this 3850 are not working, because 3850 stays as MA, though it doesn’t have the Wireless Mgmt provisioned..
As always great article. I am however trying to understand what are some really solid benefits and differences with this new CA. So far every where I have read it just seems like CA ads a whole buncha new fancy words and additional configuration but it really is doing the same thing as before such as someone taking two controllers creating a CAPWAP tunnel between them and setup mobility groups. What am I missing here? This is The best of BESTs Forum ! thank you for this great article, it is very useful. I have a campus networks which consists of 5 buldings, which have respectively 9 MAs, 6 MAs, 8 MAs, 5 MAs, 1 MA. all are Cisco 3850 switches. I also have 2 WLC5760 that will be installed only in one of the building. the buildings are connected together over an IP MPLS cloud. is it possible to deploy a solution in which I use cisco 3850 MA in the branches and WLC5760 as the MC? meaning, I will not use cisco3850 MC at the branch side. I read somewhere that it is not recommended for the MAs and MCs to be connected over WAN. Can you please clarify this for me, and if you have any advice on how to design my setup kindly let me know. thank you for this wonderful and useful article. I have a campus networks which consists of 5 buldings, which have respectively 9 MAs, 6 MAs, 8 MAs, 5 MAs, 1 MA. all MAs are Cisco 3850 switches. is it possible to deploy a solution in which I use cisco 3850 MA in the branches and WLC5760 as the MC? meaning, I will not use cisco3850 as MC at the branch side. I read somewhere that it is not recommended for the MAs and MCs to be connected over WAN. as per the below link. please advise me on how to build my setup. what is the correct design in my case. How far apart these buildings are ? What is the delay between each site across this MPLS WAN ? Cisco recommendation is each sites should have own MC rather having centralized MC. these buildings are over cities. what to do in this case? and if I make one 3850 in each building to be an MC for that building, is it possible to connect Access Points to that MC?? and what about the WLC5760 that I have, all remote MCs should be registered with it? and also the MAs, or the MAs will be registered to their local MC, local to the building. please clarify this to me as am confused. If I use an MC (3850) in each branch, the customer asking me that they need to authenticatate corporate users (Corporate SSID) via active directory and Guest users (GUEST SSID) via Local database on the MC (3850). is it possible to integrate the MC (3850) with active directory? how I can configure authentication on MC (3850) to accomplish customer requests? is this a valid design? please need your support on this. can you use current cuwn 5508 with converged access..? can they both work together? will it affect anything on the current 5508 which is in cuwn ? You can if 5508 running 8.0.x code. Beyond that release it is not supported. 1) So if someone has a 5508 and they upgrade the code to 8.2 or 8.3 they can’t do converged access and use the 5508 as the MC? 2) You mentioned Cisco’s recommendation is to use 3850 stack for MC. But if it is big enough building can’t we utilize a different controller (converged access enabled) and 3650 switches to keep the cost down as MA’s? Since all APs’ will need to connect to these switches if I have a single stack of 3850 in the MDF and I can’t connect some AP’s to it then I can’t get those AP’s to join the 3850 controller. Unless you mean use 3850 as the MC and then use additional 3850’s or 3650’s as MA’s for rest of the building? 3) What do you mean by do not think about any centralized MC? I was looking at the 5760 site and it isn’t so far showing eol/eos. 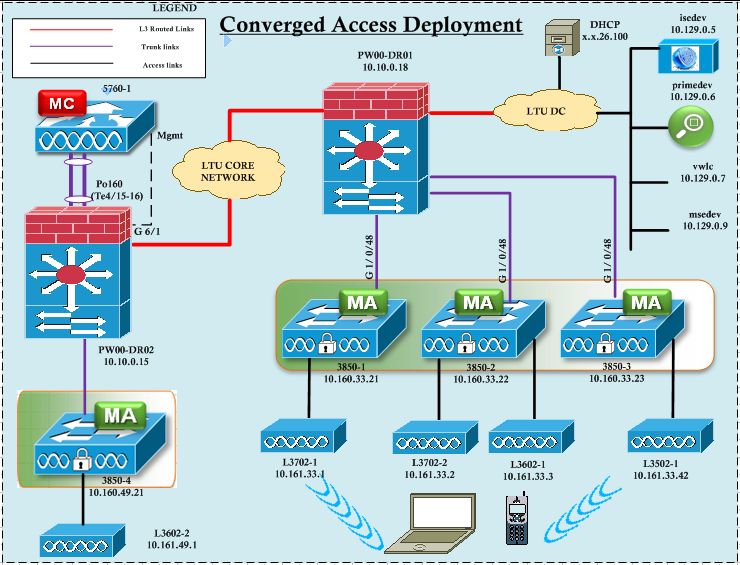 I know lot of questions but just trying to clarify and get better understanding of this converged access. 2. There is no other platform supports MC role as centralized controller. You have to use existing 3850/3650 as MC in a given building. Typically single MC for a given building (unless you have very large number of floors). Also I have a 2504 in a lab and with 8.0 code it does give me an option to “Enable New Mobility (Converged Access). Does that mean I can use it as a MC? Thanks again. I love Cisco but some times with the way they introduce features and licensing it gives me a headache :). We have deployed converged Wireless at our office. We have configured Cisco 3650 and 3850 Switches as Mobility Controllers and Agents. Now we are configuring Wireless Anchor to move the guest traffic out to DMZ. We have noticed that the switches configured as Mobility Agent can’t be configured to anchor the traffic. Do we need to change the role of Mobility Agent to MC and if so then what will be the impact on users and what we have to consider technically before doing this? on MA, when defining guest wlan, you can configure mobilty anchor as MC under WLAN config. Thanks, I will test it and let you know if it worked. Let’s imagine that I have use Cisco Cat 3650/3850 as a collapsed core/distribution switch at Branch office and there should be a couple of 2960-X access layer switches directly connected to the core. Different model of WAPs(1850/2600/2700/2800/3600/3700/3800) are currently connected to access layer switches. I’m sure that 3650/3850 switches can be used as MC and that should be my initial deployment. But what if on later stage I would like to introduce 5760 WLC as MC and would like to convert existing core switches to MAs. Am I able to keep existing topology without reconnecting all the WAPs directly to the core/distr. switches? I’ve heard that link between MA and remote switch MUST be configured as access port?! What if I have bunch of existing VLANs on access switch? What if I have a couple of existing WAPs directly connected to the same access switch? 2. 5760 is already EoS/EoL, so do not plan to have it in your network. Thanks for this blog – here’s one for you, within each LAP via WLC Appliances (eg: 5508), there’s a “High Availability” tab where you’re allowed to configure up Primary, Secondary, Tiertiary, etc… have you come across a requirement (and appropriate config/topology) to deploy the WLC Appliance as primary, but then the 3850s as a secondary? There’s probably a dozen reasons against this, but ones that comes to mind quickly would be the LAPs firmware and the AP Pass Thru – your thoughts?